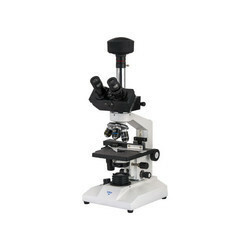 Manufacturer of a wide range of products which include metzer m dissecting microscope, metzer m trinocular digital tissue culture microscope, metzer m binocular research microscope, metzer m medical research microscope, metzer -m advanced research trinocular microscope and metzer m trinocular tissue culture microscope. 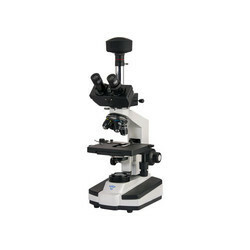 Observation – Trinocular, 1x Magnification With Interpupillary And Diopter Adjustment. Mechanical Stage – Cxl Low Drive,Triple Plate For Comfortable And Convenient Manipulation Of Slide. 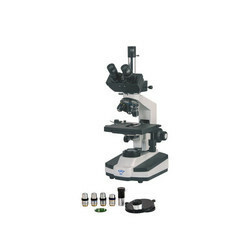 Focusing System – C O – Axial Coarse & Fine Mechanism System With Ball Bearing Guide Ways. Illumination – Koehler's Illumination System 12v – 50w Halogen Lamp. 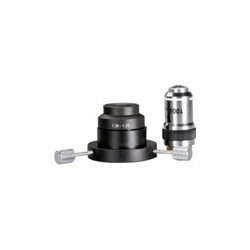 Quadruple Nose Piece – Quadruple Ball Bearing Nose Piece With Click Stops. Lwd Objectives – 4x, 10x , 20x (SL) & 40x (SL). Anti Fungal Coated & Infinity Corrected. Eye Pieces – 10x Paired. Extra Wide Field, Anti Fungal & Anti Reflected. 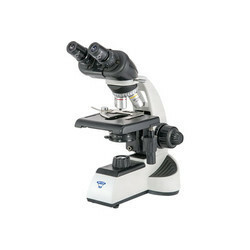 Magnification – 25x – 1500x. 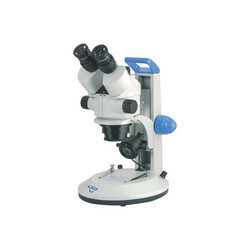 Observation – Binocular 45˚, 360˚ rotatable, with interpupillary and diopter adjustment. Illumination – Built in base LED 3W – 3V with intensity control regulator. Condenser – Moveable Condenser 1.2 N.A. provided with iris diaphragm . Nose Piece – Quadruple revolving nose piece with positive click stops. Objectives – Achromatic 5x, 10x, 45x & 100xoil (SL). Focusing – Separate Knobs For Coarse And Fine Motion. 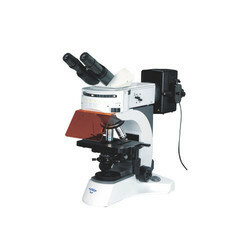 Illumination – Plano Concave Mirror In Fork Mount Replaceable By Sub Stage Microscope Lamp. Condenser – Moveable Condenser 1.25 N.A. Provided With Iris Diaphragm. Nose Piece – Dust Proof Triple Revolving Nose Piece With Positive Click Stops. Objectives – Achromatic 10x, 45x & 100xoil (SL). Eye Pieces – Huygenian 10x & 15x. Or W.F. 10x. 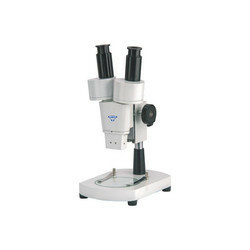 Observation Head – Seidentopf Binocular Head Inclined 300 Rotatable At 3600 And Diopter Adjustment Ring On Ocular Tube (+/-5) With Interpupillary Distance From 48 Mm To 75 Mm. With Trinocular Head. Mechanical Body – Co-Axial Focusing System. 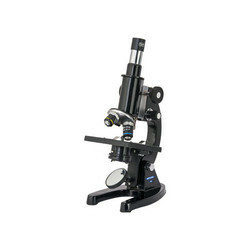 Pre Focusing Lever & Tension Adjustment Ring Reverse Angle Quadruple Nose Piece Revolves On Ball Bearing. Double Plate Mechanical Size 140mm X 132mm Having Low Positioned Co-Axial Controls. Coarse Stroke 37.7mm / Rotation, Fine Division 0.002mm. Cross Travel 78mm X 54mm. Stand – Rectangular Base, Heavy & Stable With Transformer And Electrical Fitted In Side. Focusing System Rack & Pinion Arrangement Coarse Focusing With Pillar Clamp. Coarse Adjustment App. 50mm. Illumination Built In Base Led 3w – 3v Transmitted & Reflected Light Intensity With Control Systems. Eye Pieces 10x Paired. Extra Wide Field, Anti Fungal & Anti Reflected. 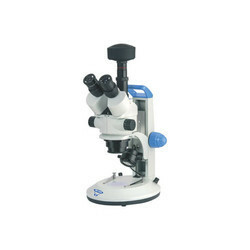 Observation Binocular Inclined At 45˚, Rotatable 360˚. 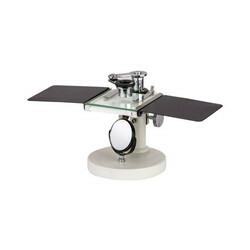 Stand Flat Duly Balanced With Milky Glass Plate And Clips For Specimens. Observation Trinocular, 1x Magnification With Interpupillary And Diopter Adjustment. 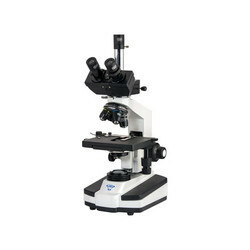 Observation Trinocular 45˚, 360˚ Rotatable, With Interpupillary And Diopter Adjustment. Mechanical Stage Co – Axial Low Drive Double Plate Mechanism System Travel On Ball Bearing Guide Ways . Focusing System Co – Axial Coarse & Fine Mechanism System With Ball Bearing Guide Ways. Burner Power Supply Unit. Input 220v Ac 50hz. Protection Barrier To Resist The Ultra Violet Light. All Electric Systems Are As Per Ce Standards. Fl Achromatic Objectives 4x, 10x, 40x (SL) & 100x Oil (SL). Anti Fungal & Infinity Corrected. Focusing Coarse And Fine Focusing By Conveniently Placed Separate Knobs 1 Div. 0.002 Mm. Illumination Built – In Base 6v – 20w Halogen Light Source With Precentered Light Condenser. 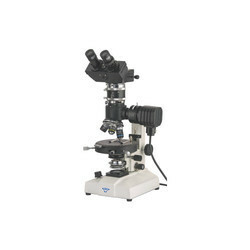 Condenser With Iris Diaphragm And Swing Out Filter Holder Focusable By Rack & Pinion. Nose Piece Quadruple Revolving Nose Piece With Positive Click Stops. 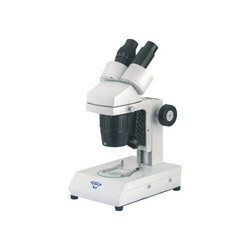 Analyzer Equipped With A Bertrand Lens, Which Can Be Swung In And Out Of The Microscope Tube For Conoscopy Observation. Compensator Slot At 45˚ Accommodating 1/4 & 1/2 Wave Length Retarding Plates. Objectives Achromatic P4x, P10x, P40x (SL). Eye Pieces Wide Field 10x . & Wide Field 10x With Cross. Objectives Achromatic 10x, 45x & 100xoil (SL). 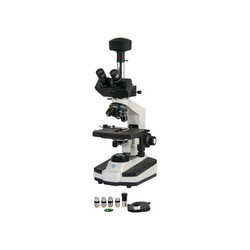 Magnification – 100x – 1500x. 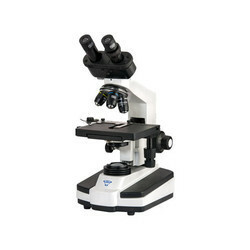 Observation – Monocular Tube 45˚ Rotatable Through 360˚. 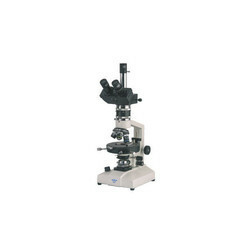 Focusing – Separate Knobs For Coarse & Fine Motion Having Least Count Of 0.002 Mm. Stage – Fixed Square Stage Size 120 X 140 Mm. With Co-Axial X & Y Movements . Condenser – Moveable Condenser 1.25 N.A. Provided With Iris Diaphragm . Nose Piece – Triple Revolving Nose Piece With Positive Click Stops. Stage – fixed Square Stage Size 120 X 120 Mm. With Clips. 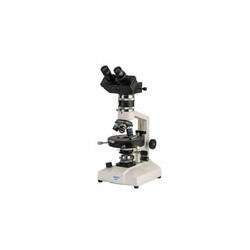 Condenser – Fixed Condenser 1.25 N.A.Is Provided With Iris Diaphragm. Objectives – Achromatic 10x, & 45x (SL). 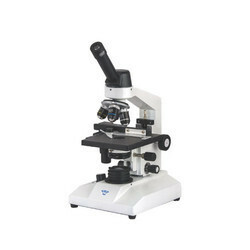 Observation – Trinocular 45˚, 360˚ Rotatable,With Interpupillary And Diopter Adjustment. Stand – A Rigid & Heavy Stand. Stage – Fixed Square Stage Size m. With Co-Axial X & Y Movements . Eye Pieces – Wide Field 10x & 15x. Digital USBCamera – 1.3 Megapixel Color CMOS sensor, Size 6.55 x 4.92mm, Pixel size 3.2 micron square, PC interface, 30 bit color depth, exposure time 1 Microsecond to 2 seconds. 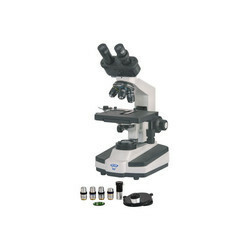 High Image Transmission convenient to use any standard Microscope. Digital Camera can change image into Digital signal & send it to your P.C. 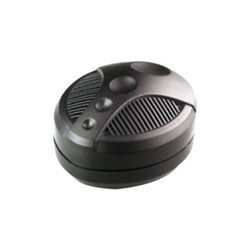 Illumination System Illuminator Systems With Ultra High Brightness 3w Led Lamp Brightness Control Knob. Interpupillary Distance 48 Mm - 75 Mm. Mechanical Body – Co-Axial Focusing System. Pre Focusing Lever & Tension Adjustment Ring. Reverse Angle Quadruple Nosepiece Revolves On Ball Bearing. Slot For Polarizer. Double Plate Mechanical Stage Size 140mm X 132mm Having Low Positioned Co-Axial Controls On Ball Bearing Guide Ways. Substage Condenser – Abbe Condenser N . A . 1 . 2 5 With Adjustable Iris Diaphragm. Mechanical Stage Co - Axial Ball Bearing Layer Mechanical Stage For Smooth Functioning. 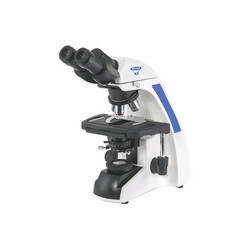 Magnification – 40x To 1000x. 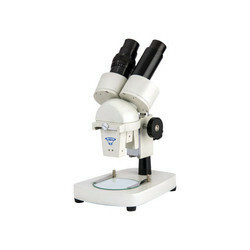 Observation – Head Binocular 45˚ , 360˚ Rotatable , With Interpupillary And Diopter Adjustment. Stand – Sturdy And Durable Pressure Die Cast Aluminium Stand. 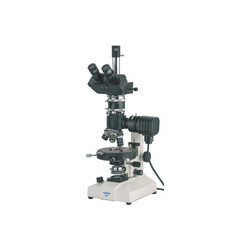 Focusing System – Co – Axial Coarse & Fine Mechanism System With Ball Bearing Guide Ways. Substage Condenser – Abbe Type N.A. 1.25 With Iris Diaphragm For Resolution And Contrast Control. Din – Sp Objectives – 4x, 10x, 40x (SL) & 100x Oil (SL). Anti Fungal & Infinity Corrected. Illumination Built In Base Led 3w - 3v With Intensity Control Regulator. 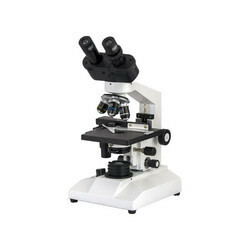 Observation – Trinocular 45˚, 360˚ Rotatable, With Interpupillary And Diopter Adjustment. Stand – Sturdy And Durable Pressure Die Cast Aluminum Stand. Mechanical Stage – Co – Axial Ball Bearing Layer Mechanical Stage For Smooth Functioning. Din – Sp Objectives – 4x, 10x, 40x (SL) & 100x Oil (SL). Anti Fungal & Infinity Corrected. Eye Pieces 10x Paired. Extra Wide Field, Anti Fungal & Anti Reflected. Magnification Range – 40x To 1000x. 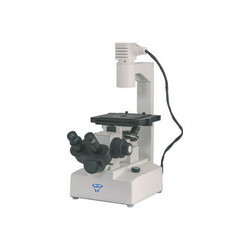 Observation Head – Trinocular 45˚ , 360˚ Rotatable , With Interpupillary And Diopter Adjustment. Sub Stage Condenser – Abbe Type N.A. 1.25 With Iris Diaphragm For Resolution And Contrast Control. 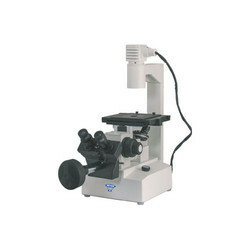 Observation Head – Seidentopf Binocular Head Inclined 300 Rotatable At 3600 And Diopter Adjustment Ring On Ocular Tube (+/-5) With Interpupillary Distance From 48 Mm To 75 Mm. Illumination System – The Illuminator Incorporated 3w Led Lamp And Has Adjustable Brightness. Quadruple Nose Piece – Quadruple Ball Bearing Nose Piece With Click Stop. Sub Stage Condenser – Abbe Type N.A. 1.25. 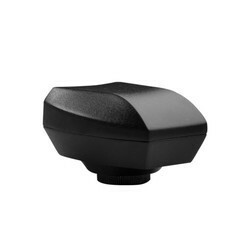 With Iris Diaphragm For Resolution And Contrast Control. Phase Objectives – 10x, 20x 40x & 100x Oil. With Centering Telescope Eye Piece & Green Filter. Eye Pieces – W.F. 10x Paired With Centering Telescope Eye Piece & Green Filter. Lwd Objectives 4x, 10x , 20x (SL) & 40x (SL). Anti Fungal Coated & Infinity Corrected. Illumination – Koehler’s Illumination System 12v – 50w Halogen Lamp. 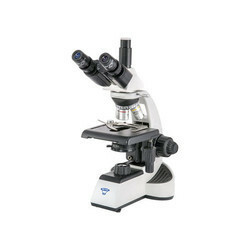 Observation Trinocular Inclined At 45˚, Rotatable 360˚. Focusingrack & Pinion With Extra Large Knobs And Slip Clutch Mechanism With Safety Stop. Objectives 2x And 4x Paired Mounted On Revolving Turret, Changing Form Low To High By Simple Rotation And No Exchange Slides. Eye Pieces Extra Wide Field 10x . Stand A Rigid & Heavy Stand. Separate Knobs 1 Div. 0.002 Mm. Focusable By Rack & Pinion. Accommodating 1/4 & 1/2 Wave Length Retarding Plates. 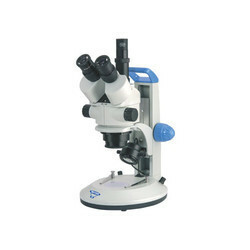 Observation Binocular 45˚, 360˚ Rotatable, With Interpupillary And Diopter Adjustment. 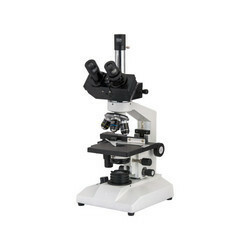 Stage Compact Ball Bearing Center Able Rotating Stage 140mm Diameter , Graduated With Vernier , Lock And Two Specimen Clips. Incident Illuminator Reflected Light Incident Illuminator Consist Of Polarizing Unit Slot For Filter & 6v – 20w Intensity Control Transformer. Condenser Sub Stage Abbe Filter Holder N.A. 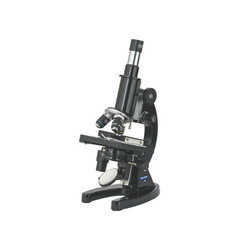 1.25 Condenser With Iris Diaphragm And Swing Out Filter Holder Focusable By Rack & Pinion. Objectives Achromatic P4x, P10x, P45x (SL). Looking for Biological Series ?